My community is allergic to spending money. Often this is a fine thing. We figure out ways to solve problems without buying things, have a lower ecological impact and are inventive and resourceful and all that good stuff. Sometimes this is crazy making. Instead of replacing the 5+ year old cheap sound system in the tofu hut we keep trying to repair it and it often does not function, And myriad other examples. 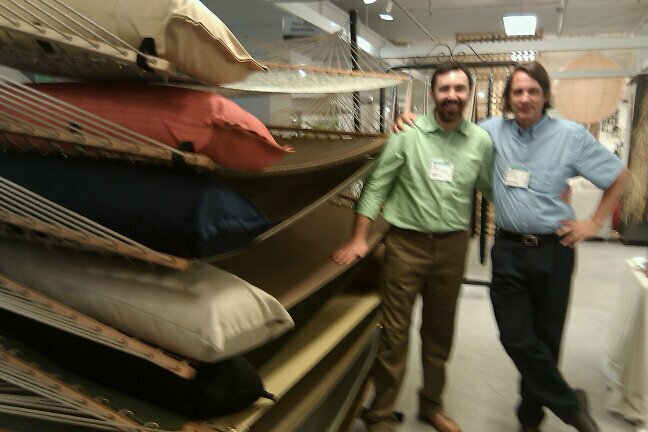 It costs us over $16K to just rent the booth at the casual furniture show in Chicago to display the hammocks we make. With the shipping, hotels, vehicle costs, meals in the heart of the city, etc the total tab for the trade show exceeds $25K. We have never come close to selling this much stuff at the show. Until this year. This year we had everything going for us. We had a great team of Coud, Hawina, Benji and myself. The economy has turned around and many existing customers who did not order last year have drawn down their inventory to nearly nothing and need new hammocks. 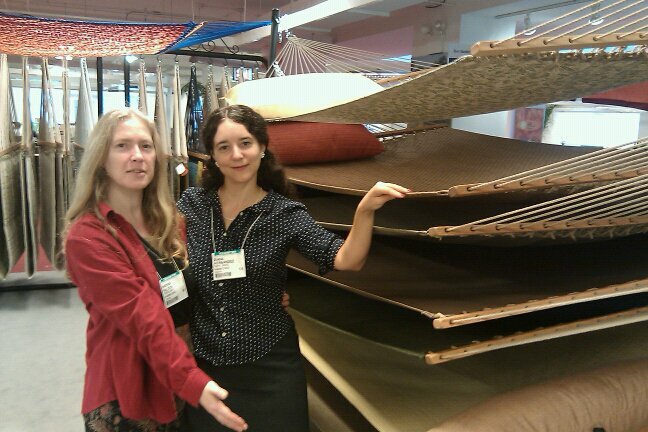 We have some beautiful new fabric hammocks to show off. And our competitors are screwing up. The hammocks market in the US is dominated by one company. It is called the Hammocks Source, but it is mostly known by the name of its biggest sub-divisions: Hatteras and Pawleys Island. In good capitalist style, Hatteras bought out Pawleys some years back and has been buying out of helping bankrupt most of its competition for years. Also in this style, they have moved most of their production to China, have pretty women who dont know their product line well in their booth and are expanding into every related market they can (rugs, swings, stands). In one of those endless management advise books In Search of Excellence they counsel you “stick to the knitting” in other words do what you know and are good at. Much to our advantage Hatteras is not doing this, they are trying to maximize their bottom line, causing a fair few upset customers, who come looking for us at the show as a replacement vendor. 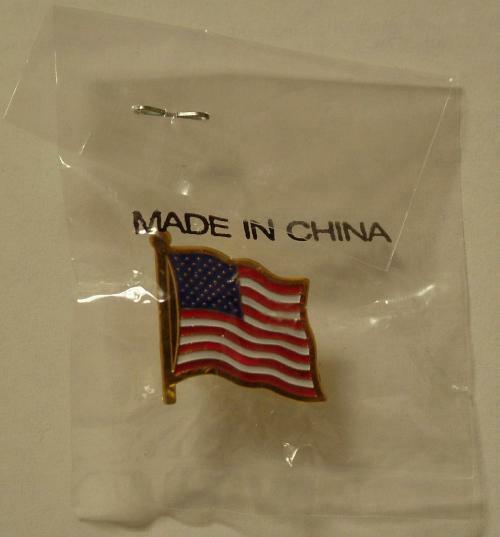 We placed an order yesterday with a former Hatteras customer who after being assured her product was made in the US found “made in China” tags in the box when it arrived. Another customer switched because the selection at our competitors was poor and limited. We landed another sale because we carry the Sunbrella high-end fabrics. i came thinking this might well be the last trade show we did, because i could not justify the expense to my miserly commune. We will leave today having landed new customers and upsold old accounts, having sold far more than the cost of the show and having well past my expectations. I am quite convinced this dream team will be returning to the windy city next year. This is really exciting Pax! I hope you guys do a good job keeping on top of production if this is going to be a banner year! @Brian: Thanks, i know you had your doubts about the usefulness of this show. It turned out much better than expected, and i have learned a lot from Benji – who markets our tofu when he is not here helping with hammocks. And we had a blast, which is key as well. Yay!!! Go team!! Y’all rock. I’m looking forward to making a LOT of hammocks when I get home!